With summer arrival and being shifted from Bangalore to Delhi ,i am finding myself more to rely on salads these days. This simple recipe includes veggies which are easily available at any place in india these days. Let me tell you about the ingredients first and their health benefits. Beets are a wonderful tonic for the liver, works as a purifier for the blood, and prevent various forms of cancer and high blood pressure.Beets are high in fiber, phosphorus, iron,vitamins A, B & beta-carotene, beta-cyanine,folic acid. C which Unriped Mangoes are best for summer that protects the body from the negative effects of high temperature.A rich source of protein and vitamin is treated best for summer diarrhea, dysentery, piles, morning sickness, chronic dyspepsia, indigestion. Garlic ,a health boosting herb keeps your heart safe from attack.Normalize your bad cholesterol and blood pressure too. two Mint beats stress and depression.At the same time this skin friendly herb are good for memory and weight loss.So, next time when you feel stressful,chew leaves of fresh mint. First place one beet directly on the gas flame and let it burn.Once you find the outer skin turned to be black,take it away from the flame and wrap a foil all round or place in zip lock pouch.Do the same to the second beet root too. 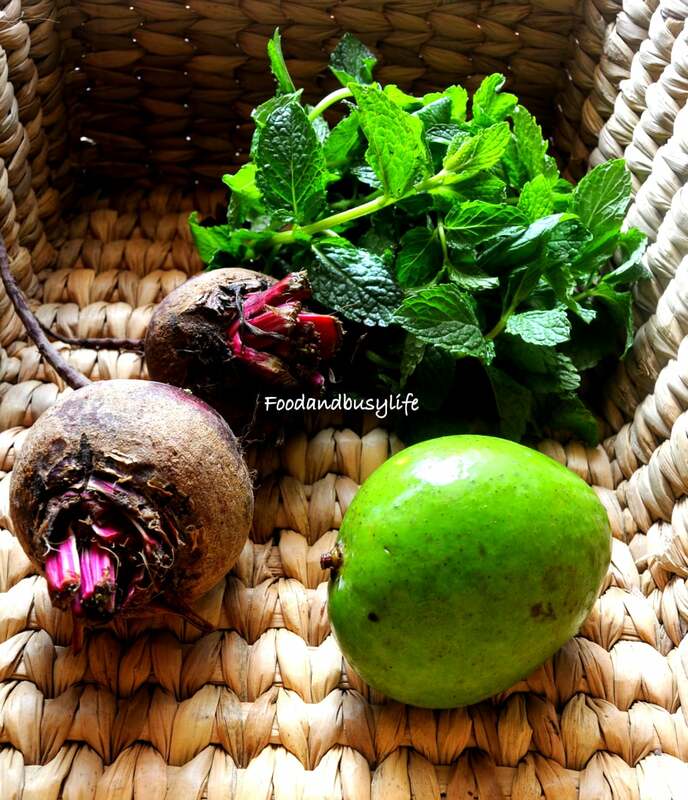 Let it stand for 5 min like that.In the mean time grate the green mango and add in you salad bowl.Add chopped fresh mint to it.Add 3-4 sliced garlic cloves depending upon your taste.Garlic is a very strong herb. Now take the smoked beet roots and rub the black skin out with your finger tips.You will find very easy to make them out.Now make round slices or Juliennes as you like.Mix them to the salad bowl. Squeeze fresh lemon juice and season with salt.Add the chopped fresh green chilly if you want some spicy flavor.